"I should be honest," says Daria Devlin on the phone, "I'm a very strong supporter of public education." This is the first thing she tells me when I explain I'm writing a story on the state of the Erie School District. Devlin is a member of the Harding PTO and has two children currently enrolled at the school and a third soon to join them. "When language arts were cut, my kids were so upset," she says. Harding offered Chinese to its students starting in kindergarten, but the program was cut, one of the many changes that rocked not only this elementary-to-middle school, but to all schools across the district. "The cutting language arts is definitely an issue--firing teachers is an issue," she says. "I'm concerned about class size." I have two children enrolled at Harding, too, and over the summer we parents had heard of the teacher layoffs, the cutting of programs, the changes that would be coming to Erie schools, but it was another thing to arrive in September for the first day and see it all firsthand. Classes were larger by as much as a third, and some had as many as 30 students. Teachers were shifted around to different grade levels to cover holes left by those laid off. Music and art instruction were cut in half. Individualized instruction offered by Title I instructors was eliminated altogether. It wasn't chaos. You couldn't call it a disaster. But things were definitely worse. Devlin admits Harding may be reasonably fortunate, too. Its PTO is actively engaged with the school and has been able to blunt the effect of the district cuts. "I volunteer at Wayne school," she explains. "Harding has a great PTO, but at other schools..." She lets this sentence trail off. That's the reality of our city. Not all children in Erie have access to the same quality of education, to the same quality of facility. And that's another problem with this year's cutbacks: they affect schools in poorer neighborhoods harder. Those neighborhoods have more at-risk students. Their schools need to provide more individual attention to underachieving students, yet the cuts struck directly at the program -- Title I -- designed to help them. It's for that reason that Devlin and many other parents support Erie School District Superintendent Jay Badams' plan to "mothball" schools next year, beginning a long-term project of school consolidation. School closures are never pleasant, but in Erie's case, they may allow the city to more efficiently use, renovate, and upgrade its school facilities in all neighborhoods. In Devlin's opinion, by doing so, Erie can provide a more equitable education to all of our children. In the meantime, Devlin is involved in starting a private foundation in Erie to steer private and corporate money into the public school system. She sees it as absolutely necessary to make the changes needed to create a more just and quality school system. "The shrinking tax base is not going to get any better," she says. No doubt Devlin's efforts to steer more local money into the city's schools is entrepreneurial in spirit, something to be praised -- and absolutely the right thing to do. But I can't help but see it as an indictment, too, of the people and institutions that have failed us. We are in the midst of a school-budget crisis. Last year, the Erie School District was looking at a $26-million deficit entering the 2011-12 school year. This year, even after massive cuts and layoffs, the district is estimating a $10-million deficit for the 2012-13 school year. How did we get here? What does this mean for the future of education in Erie? Much has been made of the overspending in the previous budgets of Superintendent James Barker's administration. Over the past several years, the school district overbudgeted for funds it didn't have, and passed on its debt from year to year, a kind of accounting that Erie Times-News managing editor Pat Howard called "financial shell games" in a recent column. The end result? A $16-million cash-flow deficit. "For several years, we had budgeted monies we had anticipated getting in grants we applied for," explained Erie School District Business Manager Rick D'Andrea, in a telephone interview. "We should not have budgeted that money. We did not get the grants." But focusing on local overspending misses the big picture. "I take exception to people who said we were reckless," said Erie School Board Director John Harkins, who is also a Democratic candidate for Erie's state senate seat, and who was present for the district's earlier cost overruns. "We were seeking, getting, and using state and federal money and putting programs in place that were helping kids." To Harkins, the real culprit for the school funding crisis is in Harrisburg. "It all suddenly took an abrupt turn when [Pennsylvania Governor Tom] Corbett got elected," he said, "and there was a dramatic shift away from funding public education adequately." And that's the first thing you should know about the Erie School District's budget crisis: funding for our city's schools -- and for schools across Pennsylvania -- was ruthlessly slashed before the 2011-12 fiscal year. Days after entering office in 2011, Gov. Corbett ordered a freeze on state spending, holding $330 million earmarked for education from state schools -- knowing that federal funds existed to replace the missing state money. As a result, Pennsylvania school districts were forced to rely on one-time federal grants to run, money that would disappear at the end of the year. Additionally, the state had already used $650 million in federal stimulus money for education in lieu of state money. That funding, too, vanished after the 2010-11 fiscal year. But once the federal funds dried up, Pennsylvania public education was staring into a $1-billion hole entering the next school year. Instead of filling that hole, Corbett's administration proposed an additional cut of $1.2 billion for education, mostly from major grant programs, according to a report from The Pennsylvania Budget and Policy Center. Programs affected included the Educational Assessment Tutoring program, School Improvement Grants, and reimbursements to school districts for students moving to charter schools. The Pennsylvania Assembly restored some money for education, but the final budget still included $860 million in cuts to education, including a $550-million cut from basic K through 12 funding. The end of federal grant money and cuts in state education funding hit the Erie School District hard. According to the school district's preliminary budget for 2011-12, Erie lost $7.3 million in federal funding, as well as $6.8 million in state revenue. Combined, that meant the Erie School District began planning for the upcoming 2011-12 fiscal year more than $14 million short on revenue. And there was, of course, the operational cash flow deficit from the previous administration. While funding for the district shrank significantly overnight, costs still rose. Not that the district planned to spend lavishly the upcoming year, but basic cost-of-living and other yearly rising costs went on as usual. Wages rose, as did the cost of utilities. The district also had to pay for Social Security and retirement plans, as well as school supplies and for maintenance and repair on its existing facilities. "Basically, you're looking at declining revenues in local, state, and federal dollars," said Erie School District Director of Communications Matthew Cummings in a telephone interview, "and increasing expenses in the form of salaries, supplies, and goods -- all that added up to the challenge we now face." The lack of state and federal funding meant that the Erie School district had to make up its lost revenue from local sources, notably in the form of property taxes. But there, too, lay bad news. For starters, the recent economic downturn impacted local property taxes. Property value declined, and so did the revenue it brought to the school district, to the tune of $1.5 million, according to the Erie School District's 2011-12 preliminary budget. But in economic boom times, the demographics of Erie make raising funds locally -- to make up for state funding shortfalls -- extremely difficult. For starters, Erie is the state's second poorest city, according to 2010 census data. Erie's average household income for a family of four is around $32,000 a year, much lower than the statewide average of $50,000. Fully one quarter of the city's population lives under the national poverty rate -- twice the state average -- including over 40 percent of Erie's school-age residents. That translates into an extremely low home ownership rate, a number critical for providing revenue to the school district. Only 55 percent of Erie residents own a home, as compared to the statewide average of 71 percent. Not only do fewer Erie residents own homes, but property values in Erie are lower, too. An average Pennsylvania home is valued at over $130,000; an Erie home, around $90,000. Add all that to the fact that nearly 30 percent of all property in Erie is tax exempt, comprising mostly non-profit hospitals and universities, and Erie's capacity to squeeze out the shortfall in state and federal funding from local property taxes is negligible, especially compared with other areas of the state. That's why the state cuts for this year were especially hard on Erie. Not only do these problems with raising local revenue handicap Erie and the state's other similarly situated communities from cushioning the blow of state and federal cuts, state cuts hurt the poorest districts -- Erie among them -- disproportionately. That's because Corbett's education budget cutbacks -- instead of occurring on a per-student basis statewide -- targeted the districts receiving the most state money, the districts with poor local revenue, more at-risk students, and need for assistance programs. According to an August report in Harrisburg's The Patriot-News, "the poorest 150 school districts...lost $537.5 million in five key program lines. That works out to $581 per student." Meanwhile, the top 150 school districts "lost $123 million, or $214 per student." The Erie School District lost approximately $540 per student in state funding last year. It's for these reasons that criticism levied solely against the previous school district administration for overspending rings hollow. While the previous years' budget follies were real and injurious, that money certainly was not at the heart of the current budget crisis. The man who has to navigate Erie out of this fiscal mess is Erie School District Superintendent Jay Badams. Badams' office referred requests for information and interviews to school district communications director Matthew Cummings, but it's not hard to take measure of the man from the public record. According to the Erie Times-News, for example, one of the first things the new superintendent said in his interview with the newspaper's editorial board shortly after his hire in 2010 was, "we're not an employment agency. I anticipate a decrease in the number of jobs." In subsequent interviews, Badams has half-joked he doesn't anticipate being appointed a second term as district supervisor because of the "emotional" decisions he has to make for the city's educational system. In that sense, Badams is perhaps the perfect person to navigate the school district through its fiscal crisis. To meet the current budget's starting $26-million deficit, the school district under Badams laid off 240 teachers and 19 administrators. The district also used its Title I funding -- intended for special programs for economically disadvantaged and under-performing students -- to pay for all-day kindergarten, normally funded by block grants, $2.5 million of which were cut by the state. The administration also refinanced a 1998 bond, delaying a payment of $5.8 million, a debt that Badams and the school district seeks to pay off in the 2012-3 fiscal year. Badams hoped that Erie school teachers would agree to a pay freeze -- which would have been worth approximately $530,000, according to the district's 2011-12 preliminary budget. But the district and the local teacher's union -- the Erie Education Association -- couldn't reach an agreement. The union offered to insert an additional year with a pay freeze into their existing contract with the school district, essentially extending their contract an additional year, but discussion let to no agreement on terms. "We were amenable to a pay freeze entered into the existing contract," said Marcus Schlegel, representative of the Pennsylvania State Education Association, in a telephone interview. "They chose not to agree to that." Badams' initial budget proposal also included a property tax hike of 4 mills, or roughly 0.4 percent -- essentially, $400 on a home valued at $100,000. But the school district couldn't raise taxes that high without voter approval, so Erie schools increased the rate by 0.95 mills -- $95 on a $100,000 home -- which raised about $1.8 million in revenue. The result of these cuts was felt keenly in Erie schools. Class sizes grew by about a third in 2011-12, and many teachers were shuffled to new assignments, teaching new grade levels to fill positions of those laid off under the cutbacks. Some of those teachers facing new assignments were former Title I instructors, who formerly gave individualized instruction to students and were now required to teach full classes. Other programs were eliminated or cut back, too, including language arts, music, and art. This school year, the Erie School District is spending approximately $10,284 per student. The statewide average expenditure per student is $13,299. Even after the layoffs, cuts, and class consolidation, district superintendent Badams was faced with the school district's legacy cash flow problem. After selling off delinquent taxes -- for about $4.5 million -- and applying unexpected state money to the debt, the school district was still left with about $10 million to pay. That deficit threatened the district's ability to meet payroll, and the district administration also wanted to make up the shortfall, instead of passing that deficit on to future budgets. To erase that deficit, the Erie School District is engaging with a local authority -- the Erie County General Authority, itself an affiliate of the Economic Development Corporation of Erie County -- in a building sale and lease-back agreement, which will raise just over $10 million. In essence, the school district will sell four of its administrative buildings -- the district service center on 16th Street, the Erie Family Center for Child Development, the district central kitchen, and the Dr. James Baker Leadership Center -- and lease the properties back for a fixed term of nearly two decades. At the end of the term, the district will buy back the buildings for $1 each. The school district will continue to use the buildings, including providing for the maintenance and staffing of the facilities as usual. The sale and lease-back agreement is a debt consolidation measure, akin to taking out a bank loan to pay off credit card debt. "If they used normal school district financing," said John Elliott, the Economic Development Corporation's chief executive, explaining why the district is engaging in the building sale, "they would be limited to a 10-year term, fully amortized loan, and they would have to go through a court proceeding in order to do an unfunded bond issue." In short, if the district had pursued a straight-up loan to pay for this year's operating costs, it would have had to go through a lot of legal hoops and likely would have ended up with a loan with higher interest rates for less money than they need -- about $7 million, speculated Elliott. "Which means it would take a couple more years of punching off cash flow," said Elliot, "and that would mean deeper cuts next year." Instead, the school district took advantage of a law that allows it to sell, without state approval, non-academic buildings to a local authority. In order to raise the money for the purchase, the Erie County General Authority will issue a bond. "The bonds will be backed by the lease agreement with the school district," said Elliott, "and because school district leases are guaranteed by the state, the same way bonds are, the school district bond rating plus the state bond rating applies, so it'll be an A-rated bond." That rating ensures that the authority will be able to purchase the bonds at a low, fixed rate. The Erie School Board approved the transfer and lease-back plan in mid-March. The pricing of the authority's bond still remains, which will set the length and term of the lease agreement for the Erie School District, but it looks as if the deal is done, and the school district will erase the current cash flow problem it inherited from previous budgets. That $10 million cash flow problem is the last bit of trouble the Erie School District wrestled with from the 2011-12 budget. But with Gov. Corbett proposing no new increases on education spending for 2012-13, the Erie School District will face more hard choices for next year. After all, given the school district's yearly rising costs, the state's funding amounts to another cut. That, combined with Superintendent Badams' intention to pay off the $5.8 million from last year's deferred bond payment means the district is facing a $10-million deficit for next year, according to District Communications Director Matthew Cummings. How does the school district plan on making up this deficit? "As we go forward here over the next month or so," said Cummings, "we'll be looking at suspending operations between one and four schools." Cummings was careful not to say schools would be "closed." "Those schools might be repurposed," he said, "just because we suspend operations for next year doesn't mean it's not brought back into operation." According to Cummings, there are "significant savings" from suspending operations of school buildings. "I've seen figures of up to a million dollars per building," he said. That number, of course, includes cutting the maintenance, administrative, and teaching staff that help maintain the building. "We're trying to restructure retirement incentives for instructional and non-instructional personnel," said Cummings, explaining the school district's strategy for trimming staff. But school closures aren't necessarily a bad thing. "I think the most important thing to remember," said Cummings, "[is that] all of these efforts are made so we can get to a level of equity across the district and parity with our neighbors across the state. "Where you live shouldn't dictate what kind of school facility and resources you have." To understand the school district's rationale and ever-optimistic outlook for closing schools, not only to save money but to improve the quality of education in Erie, it's helpful to be familiar with a 124-slide PowerPoint presentation called the "District-Wide Feasibility Study," prepared for the Erie School District by consultants, notably McKissick Associates, that takes a long-range look at Erie's educational facilities in the context of city demographics. To wit, Erie's population has been shrinking steadily since the 1960 census, which pegged the district at 138,000 residents. Each census since 1960 has showed a decline. The latest -- in 2010 -- showed Erie with 101,786 residents. Of course, as the city's population declines, so does the number of school-age children and the number of pupils enrolled in Erie schools. In the past five years alone, the school district has declined by 200 students. That means that fewer students are using school district infrastructure, built mostly in the first half of the 20th century for a burgeoning population. That, in turn, means we're using our existing infrastructure less efficiently than planned. We're paying for more buildings than we need. And every dollar spent on heating and energy, building repair, other basic maintenance, like cutting grass for those buildings, is a dollar not spent on students. Among the many pages in the McKissick presentation are tables showing the "building utilization" of schools across the district. In the rows and columns of these tables, each school is listed with its "standard utilization rate" -- essentially, how much of each school's capacity is being used. McKinley elementary is at 55 percent capacity, for example, Pfieffer-Burleigh school is at 71 percent capacity. Other under-capacity schools jump out. Central Tech at 39 percent, NW Collegiate at 63 percent, Diel and Harding in the 70s. When this utilization of the district's school facilities are added up, the district is at 72 percent of standard capacity, and 63 percent of practical capacity. And the schools are in different states of condition. Some, like Burton, Edison, Lincoln, and Irving elementary schools are in "poor" condition, according to the report, while others, like McKinley and Connell are in "good" condition. But all need expensive renovation in order to maintain the facilities into the future -- those repairs are going to cost the district $271 million. Next from McKissick will come a proposal for various long-term plans for consolidating Erie's schools. Based on such factors as location and school condition, the various proposals will identify which Erie schools should be "mothballed" so the remaining schools will be more efficiently used. Those proposals will be unveiled in an April meeting. That's why the school district is waiting for McKissick's proposals before identifying which of its schools will suspend operations next year. Badams' administration is trying to fold the immediate demands of the budget into a long-term school consolidation plan. Revamping the city school system may hinge on Harrisburg, though. Buried in the 2012-13 state budget is a one-year moratorium on state reimbursements for school construction projects. Again, a hit to school districts like Erie with poor local revenue sources. "I salute him, and I'm glad he's doing it, and it's bold," said School Board Director John Harkins, "but the whole project is in its early stages. It's a five-year target, and he's going about it in the right way. It's going to need to have public interaction and input. "His hope is to take it to Harrisburg, say, 'here's our approach, we need help.' He's hoping to create a new model that they'll use." 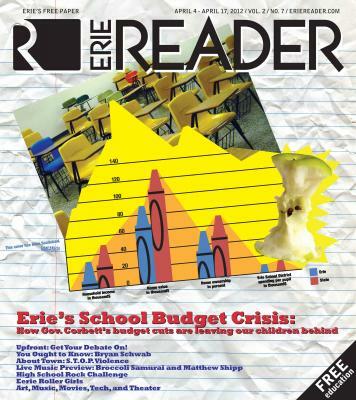 It could be argued, in a very rose-colored glasses, glass-is-half-full way that the Erie School District budget crisis, and Superintendent Jay Badams' ruthless and swift response to it, will improve the financial health and future health of the Erie public school system. Of course, there's the reversal of previous budgetary inefficiencies, the payoff of a debt handed to the district from previous administrations, and a new policy of only budgeting expenditures with monies that are certain. More important than that are the changes to the district's infrastructure. Consolidating schools is a difficult and unpopular thing to do, yet Erie's declining population and rising costs around facility maintenance make the school district's long-term school optimization project necessary. It's not likely a superintendent in normal budgetary times would have the political capital to make the changes. And the changes will benefit Erie, make the school buildings better for students, and allow the district to more efficiently distribute funds to all neighborhoods and all the students in the city. But that's the optimistic, squint-so-hard-you're-almost-blind view of school district budgetary woes. A more realistic view has to include the real hurt the cuts have done to education in the city. That is, it's hard to disagree with PSEA representative Marcus Schlegel's assessment of Gov. Corbett's education policy -- a policy of slashed education funding that led directly to this crisis in Erie and in school districts across the state. "I think Gov. Corbett stayed true to those who funded his campaign, reflected by the amount he put into Corrections and how he refused to collect any revenue from the fracking industry." The facts seem to support Schlegel's claim. In last year's budget in which he slashed $800 million from education, he increased spending to Corrections by $180 million. Corbett's administration has also famously dragged its feet on taxing the energy industry's fracking profits, even as most other gas-producing states do -- including conservative bastions like Wyoming and Texas. A gas-drilling tax, according to some estimates, would bring between $200 and $400 million to state coffers. The Pennsylvania State Corrections Officers Organization donated $125,000 to Corbett's 2010 gubernatorial, a sum dwarfed by the largesse handed down from the oil and gas industry. Energy companies and lobbyists gifted Corbett with a $1.49-million campaign windfall, over 10 times the amount his opponent Dan Onoranto received, but a bargain given the sums their campaign offerings have returned. Additionally, closing corporate tax loopholes and implementing some non-injurious taxes -- such as on smokeless tobacco, for instance -- could easily raise another $100 million, according to some. And that's not even considering pragmatic prison reforms -- revisiting mandatory sentencing for non-violent drug offenses -- that would greatly reduce state prison populations, save millions in funding, and actually benefit the state. Yes, we are living in a recession. Yes, revenue is harder to come by. Yes, it's likely the state is pinched to raise revenue and challenged to continue to fill all the outstretched hands it sees. But the revenue to fully fund the 2011-12 school year existed, only the Corbett administration instead chose in large part to dole it out to industries that don't need the money. "Educational equity is often discussed as a moral issue," wrote economist and Nobel Laureate James Heckman in the American Educator, "another way to think about equity is a way to promote productivity and economic efficiency...We need a capable and productive workforce that will compete successfully in the global economy. Underdeveloped human potential burdens our economy and leaves us with a workforce that is less than it could be." To tap this human potential, Heckman believes investment in education -- especially early education -- is paramount. "We can invest early to close disparities and prevent achievement gaps," he wrote, "or we can pay to remediate disparities when they are harder and more expensive to close. Either way we are going to have to pay." In that sense, in all of this talk of budgets and deficits and cutbacks and school closures, Harding PTO member Daria Devlin seems to be the only clear-sighted actor. One mom, seeing a public school system decay, is furiously scrambling to find money from anywhere to help Erie's schools. She recognizes this salient fact: Erie cannot support quality education on its own. We need funding from the state and federal government. But a real investment in Erie's education should pay dividends for generations to come and bring a day that Erie's local economy can support a robust school district. Erie isn't alone, of course. Especially in these times of economic trouble. School districts across the state are hurting. It's for that reason that Gov. Tom Corbett's education policy -- giving lavishly to the fracking industry while shorting schools -- is not only perverse, it will end up costing Erie, and Pennsylvania, much more than money. He is giving away our future.